It was early evening yesterday before I finally went an hour without having to block an abusive tweet from my timeline - some 24 hours after my original tweet. Even though Michael Gove can warn Andrew Marr that holding a second referendum on Brexit would "undermine faith in democracy and rip apart the social fabric of this country", it seems I'm not allowed to say something to like effect, without having to suffer a torrent of abuse. I'm not even sure though whether I find this more offensive than the preachy lectures that some readers feel entitled to publish on this blog's comment facility, but my response to either is the same. There is no point in engaging. But that, in its own way, illustrates the way the political discourse is developing in this country. The age of the internet, with the massive outgrowth of information available to us all, has not led to a new blossoming of the age of enlightenment. Rather, the control afforded by the internet enables individuals to select their sources from increasingly narrow spectra. They then need only refer to opinion that pleases them and reports of events presented in ways which support their prejudices. But enough passes through the filters for the recipients still to claim that they are well-informed. Unfortunately, there is no obvious way round this. The volume of information is such that one must filter it if one is not to be overwhelmed, and we would be less than human if we did not choose, of preference, those sources that we trust and which do not take us out of our comfort zones. From this, one could argue that the ultimate consequence is a fractured society – although one must take care not to confuse chicken and egg. Are we being more partisan in our selection of information sources because we are a fractured society, or are we a fractured society because we are increasingly partisan in our selection of information sources? Perversely, there is one thing we cannot claim to be, with access to the unimagined wealth of information – and that is more informed. This might be one very real area where more is less. This struck me as I was scanning an editorial from the Guardian - something which I rarely bother to do. On the eve of a week-long debate on Brexit in the House of Commons (when the chamber, for the most part, will be near-deserted), the newspaper declares that: "it is time to choose". There are four options, it says: May's deal, a softer deal, no deal or a second referendum. Tucked into the text, though, is the devil's work – an insidious distortion that has that paper declare that the question that faces MPs is whether "the EU withdrawal agreement and the declaration on the future framework of relations … are an acceptable basis for Brexit to go ahead". This allows this long-standing Europhile newspaper to announce that, in its view, the two documents are not a sufficient basis for Brexit to go ahead – the natural inference being that Brexit should be abandoned if they are rejected. But that is not the question before the House. Whether we should leave the EU was settled first by the 2016 referendum and then the parliamentary vote. Thus, MPs are being asked to address the phase of the process brought about by the decision to leave - how we should achieve our departure, encapsulated in Mrs May's deal. If the MPs reject the deal then the obvious consequence is that we end up with no deal. This is the default value which kicks in automatically. Even then, there are still parliamentarians – including those in the higher ranks of the Labour Party – who believe that the Article 50 process can be stopped by Westminster procedures. It can't. At this point, neither is there provision for re-opening negotiations, so that effectively rules out the Guardian's "softer Brexit" in the form of the "Norway Plus" option. In any event, this is not a viable option. Any workable plan based on Efta/EEA membership would take some years. If this was to be negotiated, it would have to wait until the end of the transition period – as long as that was possible. Basically, therefore, the only way to avoid a "no deal" scenario - in the event of the MPs voting "no" - is to abandon Brexit altogether – which is what Mr Gove seems to be asserting. Although we have not yet had a ruling from the ECJ on whether a unilateral revocation of Article 50 is possible, there is a likelihood that unanimous agreement (or even by QMV) on revocation could be allowed. In theory, this makes it a possible option. It is being argued that we would need an Act of Parliament before the Government could apply for revocation, which may or may not be the case. Assuming that the EU agrees – which isn't a foregone conclusion - it is inconceivable that the move could be made without another referendum. As to any result, that could go either way. Here, though, the Guardian gets it right, saying that this "would deepen bitter national arguments still further". We are getting back to my civil disturbance theme again. In this context, it is well worth reading this analysis by John Lichfield of the gilets jaunes disruption over the weekend. The savage violence in Paris was not a protest, he writes, but an insurrection. It was not largely the work of a fringe of casseurs (thugs) and professional trouble-makers. Nor was it provoked by the riot police, who behaved with almost super-human discipline and restraint. Despite lurid claims to the contrary, at least 70 percent, by Lichfield's reckoning, were not urban guerrillas from the ultra-right or from the anarchist left. They were amateur provincial guerrillas overwhelmingly hailing from the "suffering areas" of northern or western France or from the outer Paris suburbs. Mostly, they were men in their 20s and 30s but there were many older men and some women. As to the violence, this was "at once planned and disorganised", but the most extensive destruction was in the capital, the worst in central Paris since 1968. On the face of it, it was a continuation of protests that started a month ago as a rebellion against green taxes and a spike in petrol and diesel prices but, since then, it has morphed into a wider cry of anguish against the high cost of living, unemployment and poor local services in small provincial towns and hard-scrabble outer suburbs of the thriving French metropolitan areas. Emmanuel Macron and his government, says Lichfield, were undoubtedly slow to take the movement seriously but it is foolish to blame the long-standing problems of Peripheral France on a president who has only been in office for 18 months. 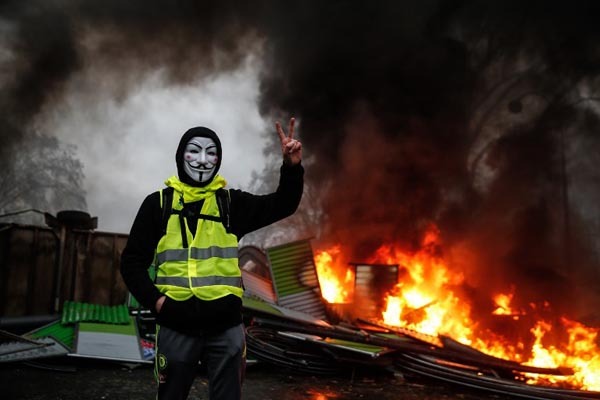 It is time for opposition politicians in France to stop pretending that Macron is the only source of yellow jacket anger. In what might be seen as a chilling parallel with the UK, Lichfield goes on to say that "many, many yellow vests are decent, frustrated, suffering people". They no longer believe that any of the mainstream political movements – or even Marine Le Pen's Far Right or Jean-Luc Mélenchon Hard Left – will do anything to help them. They talk of a new "movement of the people and for the people" but have declined so far to choose recognised leaders or to put forward a united programme. "This instant, anti-political, political movement not only detests the young technocratic President who was elected only last year. It detests anyone from within its own ranks who “put themselves forward as above the rest". And what is so striking about that is not the tale of differences, but how uncannily similar to the UK it looks – two different societies but parallel lives. There is that same, huge reservoir of resentment, disenchantment with politicians and the political system, and the "left behinds" outside the capital who feel the system is no longer working for them. ... we won't see the Victorian stoicism of the stiff upper lip. Someone will begin passing out high-visibility vests or another symbol of defiance. It may not be immediate, but chaos, loss, uncertainty and disruption will breed palpable anger. It may be Leave-voting forces in hard-up areas, those who have the most to lose from a no-deal Brexit, who protest in favor of no deal; as in France's riots, causes can be co-opted and arguments conflated. There is a lot of anger in the U.K. Stabbings and violet crime have been on the rise. So has opioid use. Britain is a hugely successful global economy, but that masks the fact that it also houses some of northern Europe's poorest regions. The scenario I outlined in my blogpost was exactly a "no deal" scenario, but one where the government then took fright and sought to re-join the EU "without due process" – i.e., without a referendum or even parliamentary approval. Yet, even the suggestion of a violent outcome was enough to trigger the reaction I have experienced. That said, those who think Brexit is going to mend our broken society are going to be disappointed. But then, the purpose of Brexit is to get us out of the EU – not to resolve the entire range of society's problems. And, by the same measure, anyone who thinks another referendum will solve anything will be equally disappointed. Brexit cannot be the repository for all the ailments afflicting our society, any more than it can be that elusive solution. Just getting us out of the EU is proving hard enough, without ladling even more problems into the mix. And if violence is the end result, it is unlikely to help us forge a solution. Things will just get messier and more brutal. However, the point has been made from numerous quarters that a potential outcome of what we might consider a "bodged Brexit" could be a serious outcrop of violence. If Lichfield has it right, this could amount to insurgency. We are not so very different from the French that it would be wise to ignore the possibility. And that puts a great deal of pressure on MPs, this week, to get it right. The only small problem is that, immersed in the tumultuous noise of the Brexit debate as we all are, I'm far from certain that anyone knows what "right" is any more.